This has been one of the most prolific seasons for Japanese beetles (Popillia japonica) in Ohio for many years. High localized populations were observed throughout the state. Adult populations of both the Northern Masked Chafer (Cyclocephala borealis) and the Southern Masked Chafer (C. lurida), two of our other common "white grub producing" beetles, were also very high this season, particularly in the central and southern parts of Ohio. Of course, high adult populations of these beetles do not necessarily translate into damaging white grub numbers. 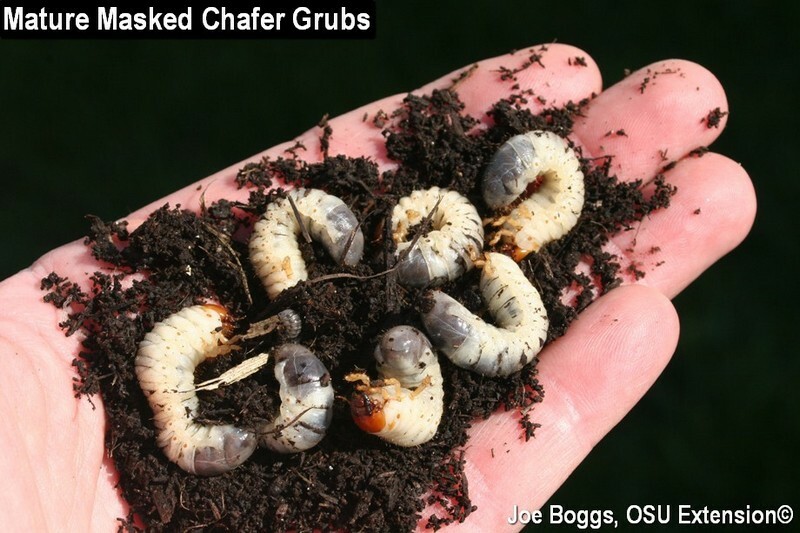 Both the chafers and Japanese beetles lay dehydrated eggs that must absorb water from the soil in order to develop, so wet soil conditions support a greater egg hatch which means more white grubs. Unfortunately, we experienced those conditions in many parts of the state. Here is a primer for white grub management. First, these white grubs flourish where there are thick layers of thatch. Indeed, Japanese beetle grubs can complete their development by feeding on nothing but thatch. Additionally, thatch layers that exceed around 1/2" in thickness can interfere with water and nutrients infiltrating into the soil and limit turfgrass roots penetrating the soil to take-up water and nutrients. White grubs clipping off the roots at the thatch-soil interface simply adds insult to injury! Thus, the first step in managing white grubs is to assess thatch thickness and making plans to correct a thatch problem this fall by hollow-tined core aeration. Remember that thatch is made up of shoots (e.g. rhizomes, stolons) that have not yet decayed. Thatch is not produced by grass clippings which are made-up mostly of water and have no woody elements. Introducing oxygen through core aeration helps to hasten thatch decay; it's a little bit like what happens by turning a compost pile. Be careful using a de-thatcher on a lawn with a thick thatch layer. De-thatchers work best to maintain a healthy thatch layer; they can rip up turfgrass along with the thatch if the layer is too thick. The second step is to consider using flowering plants in landscape designs to support natural enemies of white grubs. Research by Dan Potter (Entomology, University of Kentucky) and his graduate students has demonstrated that "pollinator gardens" can provide a boost to various natural enemies that target white grubs such as parasitoid wasps. While this will not provide an immediate solution, it is something to plan for around lawns with a history of grub damage. There are also various "preventative" and "curative/rescue" products that are effective against white grubs. As their name indicates, preventative products are intended to prevent grub damage by killing young grubs. However, the clock is ticking! For example, it's too late to apply products containing chlorantraniliprole (e.g. Acelepryn, Scott's GrubEx). The window remains open for imidacloprid (e.g. Merit, Season Long Grub Control, etc. ), thiamethoxam (e.g. Meridian), and clothianidin (e.g. Arena), but applications should be made as soon as possible. If grubs are not controlled preventatively, curative/rescue applications can be made using trichlorfon (e.g. Dylox, 24-Hour Grub Control, etc.) or carbaryl (e.g. Carbaryl, Sevin, etc.). Tips on minimizing impacts on "non-target" insects while maximizing the efficacy of all of the grub management products include prepping the turfgrass by mowing and raking away leaves and other debris to support soil contact with the treatment. Mowing turfgrass with blooming clover will also remove the blooms to reduce insecticide exposure to pollinators such as bumble bees. Thatch will interfere with movement of insecticides to the soil which is another reason to assess the thatch thickness and correct a serious problem in the future or use a de-thatcher if the layer is relatively thin. Watering the turfgrass immediately after application is no doubt the most important step in supporting movement of the insecticide into the soil and is particularly important for spray applications. The water will wash the spray solution from the blades before it dries and remains affixed above ground. Irrigation will also drive grubs closer to the soil surface which enhances their exposure to the toxicants.